1) Shake it out: Shaking your hands out (as though you are air drying them) helps to loosen the median nerve, preventing the nerve and your hands from cramping up. 2) Frankenstein arms: With arms straight out & relax the fingers, lift your palms up creating flat, flexed hands ( as though you are instructing someone to stop). Hold each pose for 5 seconds & repeat. 3) Prayer pose: Bring your hands to prayer pose at chin hight, slowly lowering your arms or prayer down your midline (keeping thumbs close to the body) until you feel a mild to moderate stretch in your forearms. Hold for 15-30 seconds. 4) Finger stretch: With fingers spread wide, flip your hand so that your palm faces the ceiling. Take your other hand and place a small amount of pressure on your fingers, finding a mild to moderate stretch. The closer you get to the tips of your fingers, the more you will feel this stretch in your wrist. Hold for 10-15 seconds, before switching hands. 5) Make a fist. Now open your hand to let your fingers hang. Hold each pose for a few seconds and repeat as it feels comfortable. A 2003 study, highlighted in this New York Times article, indicates that mouse users are at an even higher risk of Carpal Tunnel Syndrome than those that use a keyboard alone. Though some have found that simply reducing the size of their mouse pad helps or switching to the more economical trackball mouse is a good way to go if you have the $30 to spare. 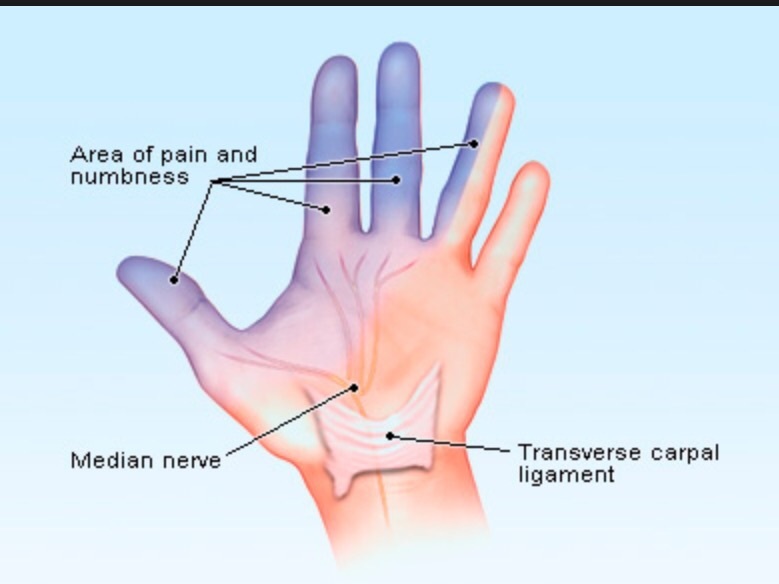 Please note that Carpal Tunnel Syndrome is a real condition that does require medical assistance. As with anything, if you are experiencing pain from an activity, cut it out and go to the stinkin doctor!